This chapter is recommended for Intermediate to Advanced users of onCourse who have a good general understanding of structured data and the onCourse schema. Go to File > Preferences > Export templates to see the list of export files available in your onCourse application. The list of exports available to you will include those supplied as part of the default onCourse application configuration and any additional custom exports you have created or have commissioned ish to create on your behalf. Generally, export files that end with CSV (comma separated files) are designed to be opened, viewed and edited in a plain text editor or spreadsheet application. These are flat files containing columns and rows of data. Export files that end with XML (eXtensible Markup Language) are designed to be imported into other software applications and represent a relational data structure. Each export displayed in this list has a Name, Entity, Code and Version Number. The Name is a descriptor of the export and usually includes information about the export format type. The Entity is the object in the database that the export is joined to, and will indicate which list view you will be able to find this export. The Code is a unique identifier for the export and when supplied by ish as part of the default onCourse application will begin with 'ish'. When the export is custom, is should begin with an identifying acronym for the organisation. The last part of the code defines the export file type, for example, CSV or XML. The Version number allows ish to automatically update the export, for example, to add additional fields as they are added to the database structure, when new versions of the onCourse application are deployed. You can double click on the export record in the list to see the structure of the export file, what fields are included and what formatting is applied. Like print reports, the list of available exports in the list view are those exports linked to the entity, or list view, you are viewing. Each list view in onCourse has the ability to export data in a variety of formats. You can either highlight the records you wish to export and choose File > Import/Export > Export (tablename) or click on the Share Icon and select 'CSV'. Export template: This list allows you to choose from one of the exports joined to this entity. There will usually be at least one CSV and one XML option to select from. Listed records: every record in the list you were just looking at. This is the result of whatever search you had just performed. Highlighted records: only those records you had highlighted in the list. This is the quickest way to export a few selected records, particularly when you need to choose them by hand from your query results. Begin by opening the Classes window and running a query or otherwise selecting the range of classes you wish to export for the brochure. From the share options, select 'InDesign Brochure XML export' and save the resulting file to a location on your computer. This default layout includes the information from the course general tab 'Print brochure description' and combines it with the class summary information including location, cost, start date and time and tutor. The information is grouped by the Subject tag hierarchy. The XML file is designed to be imported into a publishing product such as Adobe InDesign and then customised however you wish with the addition of styles and images. The XML tags in the onCourse export can be mapped to styles in InDesign, allowing the data to be imported and dropped into a brochure layout as many times as needed during the production cycle process. The XML file created by onCourse is not designed to be opened or edited in a product like Word - it is designed for import into a specialist layout and design software tools. If you do not have software that can work with these files installed on your machine, you should be able to email the file to your design staff for them to work with directly. The Class list includes a number of CSV exports, some with specific purposes. 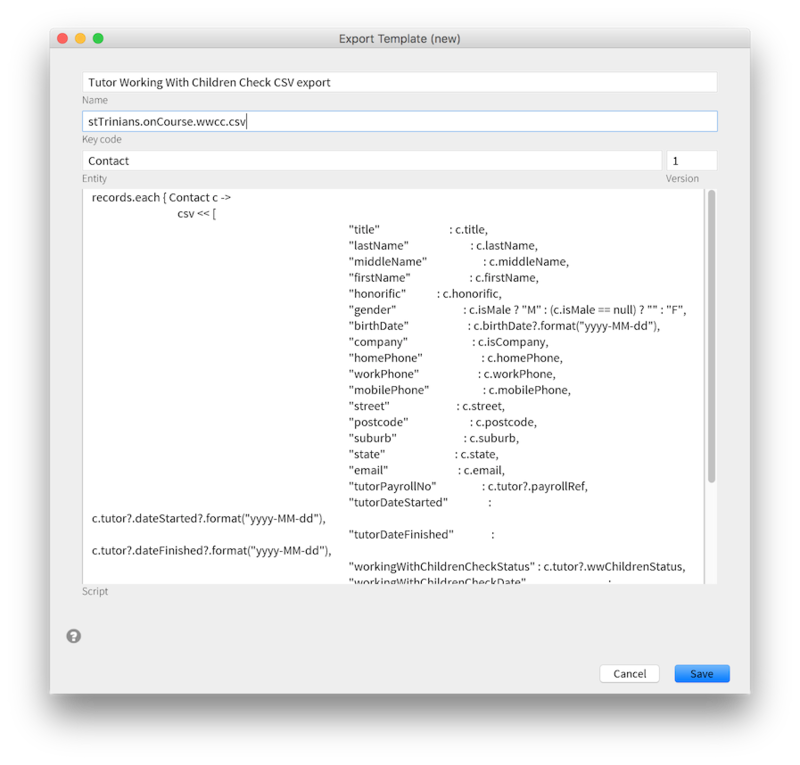 The 'CourseClass CSV export' is a generic export that includes most of the class fields. 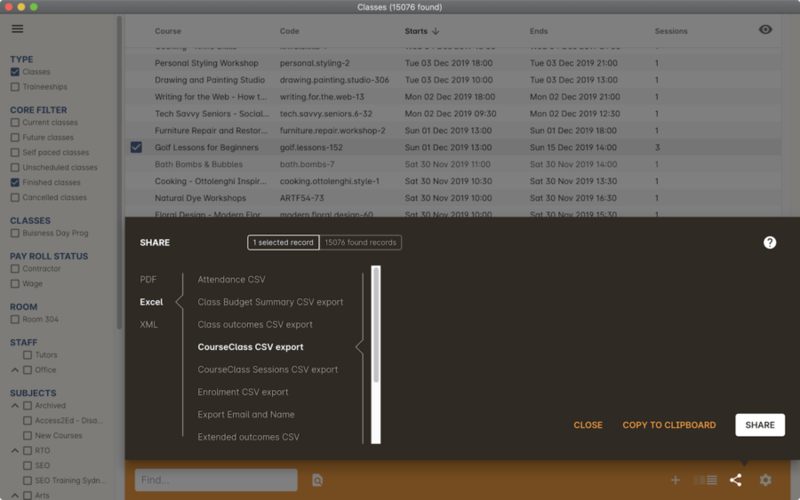 Highlight the Class records you wish to export within the Class window. Class Budget Summary CSV export - provides a Class per line summary of budgeted income and expenses against projected and actual costs. Class Outcomes CSV export - Report for student outcome results for date range so Colleges can conduct their own reporting and easily identify students with outcomes that are not set. When exporting the above class exports, the resulting CSV output file will have the same name in all instances: it will be labelled as 'CourseClassExport.csv'. You can then re-label these export files to whatever you need. onCourse enables users to export not only the invoice information, with each invoice reflected as one line within the resulting output file, you can also export the invoice line detail. Highlight the invoice records you wish to export information for from within the Invoice window. You can then export either the invoices as a standard Invoice CSV (one line per invoice) or alternatively you can export the invoice line detail. The following excerpts of the exported information as shown within excel, provides a comparison between the kind of information that each export generates within the resulting output file. When exporting the above two invoice exports, the resulting CSV output file will have the same name in all instances, it will be labelled as 'InvoiceExport.csv'. You can then re-label these export files to whatever you need. There are a range of options for creating custom exports in onCourse. What you choose depends on your familiarity with database structures, queries and the Groovy language. 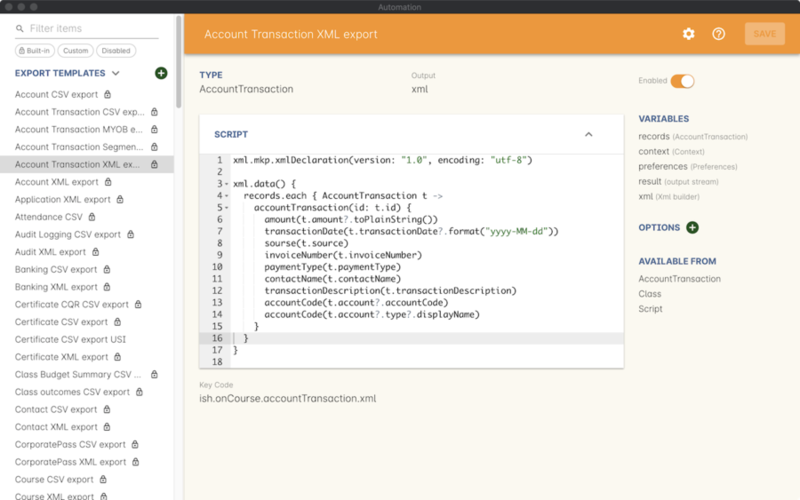 onCourse exports are powered by a groovy based scripting language. These scripts run on the server and call the same groovy DSL that you'll find in the scripting chapter and available here: https://www.ish.com.au/onCourse/doc/latest/dsl/. You can use the full power and expression of the groovy language, and have access the entire onCourse schema. In short, you access the data to export from the variable "records" and just return from the script the formatted text to export. The simplest way to begin this process is to find an existing export from the entity to copy and use as the basis of your new export. For example, if I wanted a new export for Tutor data that started from the Contact entity, I'd choose the default 'Contact CSV export' as my starting point. Highlight the text in the script field and copy and paste this into a plain text editor like Sublime Text (In a tool like Sublime you can specify the text is Groovy, so it will add colour coding to assist with the editing process). means that in this file, the letter 'c' will be used as shorthand for the 'Contact' object and the export will create a CSV file. For your export to work correctly, do not modify this header information. Means create a column labelled 'gender' and from the contact record (referred to in the shorthand 'c') take the value from the boolean isMale. If the value = true, export the character 'M', if the value is null (not set) then export a blank space, else export "F". In this example, the question mark character is the ternary conditional operator which allows for three arguments to be defined and is a shortcut way of writing an if...else statement in Groovy. Then export value would be TRUE when the contact was set to Male, FALSE when the contact was set as female, and blank, or null, when no value was set in onCourse. You can add additional rows to the export, or delete or re-order rows. Note that each row ends with the comma delimiter "," except the last row in the export file. For example, the contact export ends with the resume field value, so there is no comma after this row. You can also see above that the export file ends with the bracket closure characters "]" and "}". It is important you don't remove these. If you want to access data from other objects than the entity defined in the export, you need to add joins to the export and structure your query in a way that matches the onCourse DSL and schema. For example, in the contact CSV file, some of the fields are from the student or tutor object. These joins are represented by the full stop character. For example, the Working With Children Check Reference number is part of the tutor object, so the join from the contact to the tutor is 'c.tutor.wwChildrenRef' which means the same as 'contact.tutor.wwChildrenRef'. Refer to the Custom Field documentation for more information about creating custom fields in onCourse. When you are ready to test your new export in onCourse, you can create a new export and copy your export code. Go to File > Preferences > Export Templates and click the + in the top right hand corner to create a new export. Name your export. This is what appears in the drop down when you run the export, so make it clear. Join your export to the correct entity. The name must be spelt exactly as it appears in the DSL documentation with the correct capitalisation. Copy and paste your code into the body 'script' and save your export. Once you have saved your export, it will now be available for you to test in the Entity you defined. If you attempt to run the report and instead of generating the expected output, it shows an error in the window, then you need to adjust your export code to resolve the error, save the changes and try again. This may be a process you repeat a few times if you are new to creating and editing export files. When your export runs successfully, check the output is formatted as expected, and make adjustments to your export as needed. Please note: When opening CSV files in a spreadsheet application like Excel, Excel may reformat some of your data based on it's own rules. For example, data it thinks are numbers will often be reformatted, so the leading zeros from mobile phones numbers may be stripped . You should run your formatting checks in a text editor like Sublime or Notepad. To export your AVETMISS go to the file menu, select import/export and choose Export AVETMISS. Select the date range you wish to export and where you wish to export the files to, e.g. your desktop, and select proceed. The 10 txt files will then be created ready to be submitted to the government reporting agency of your choice. Easy as! For more information about how the onCourse data collection and various AVETMISS export options work, see the AVETMISS chapter. onCourse already comes with a template for exporting to Adobe InDesign. Use the searching feature to find the classes you want in your brochure. This might be one or a thousand classes. Choose "Import/Export" from the File menu and select "Export classes". Select the "InDesign Brochure" output format. Export this data and save it to disk somewhere. It will be an XML file, ready for InDesign. Now fire up Adobe InDesign and import this file. Choose your XML file which you just exported from onCourse. The structure of the data will now appear in the left column. You can drag any element into a text box in your layout and have the text automatically flow through. Use the "map tags to style..." menu item to map the tags against your paragraph and character style sheets. Once this is done you can save the mapping so that next time you create this document with fresh data all the styles are linked quickly and simply. If you now spend a bit of time tidying up your stylesheets (both character styles and paragraph styles) in InDesign you can set up the whole process to be almost completely automated. 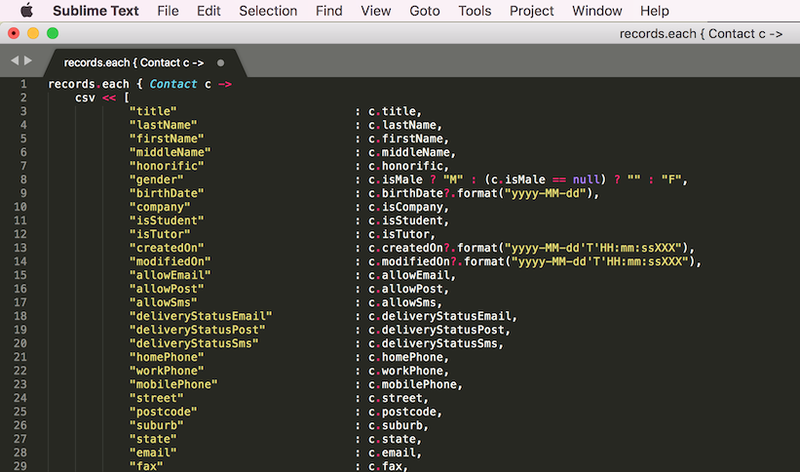 Next time you export from onCourse, the data will flow right into InDesign complete with all the formatting you need. Just paginate your brochure, place in some pictures and you are done. If you need to customise your export further, you can do this yourself if you have the skills in house, or engage ish to make the changes for you. onCourse has an export that allows you to export student data into OLGR for the state of NSW. If your organisation utilizes MYOB as the key financial system, you can generate an export that is specifically designed for importing data directly into MYOB. There are 2 different pathways within the onCourse Client to access and generate the financial data export for MYOB. The benefit of utilizing the Summary Extract path when exporting financial data, is that onCourse enables you to set the date range for the data that is to be exported. As well as remembering the date up to when the last data export was run. Click on the Exportbutton to run the export. Note that the resulting file will be generated as a text file. Using the onCourse Groovy scripting engine, powerful import process can be created in onCourse for either once off events or a regular data transfer between onCourse and a third party software service. For once off type data imports, you may like to read our chapter on Migrating to onCourse. For regular data transfers, you may like to read our chapter on External Integrations. Custom import processes and integration scripts can also be created on request. Please send your request to support@ish.com.au for a proposal. onCourse AVETMISS outcome import - Using data from an import set of NAT00120, NAT00060, NAT00080 and NAT00085 file, create new students in onCourse with their existing AVETMISS file student number. Import their contact record into onCourse and update their record with their outcomes in the onCourse prior learning record. The prior learning records are grouped by qualification, where the qualification data is supplied in the NAT00120. This import is most commonly used during system migration to import data from another AVETMISS reporting tool into onCourse. Running this import on the same data set twice will create duplicate records for each student. 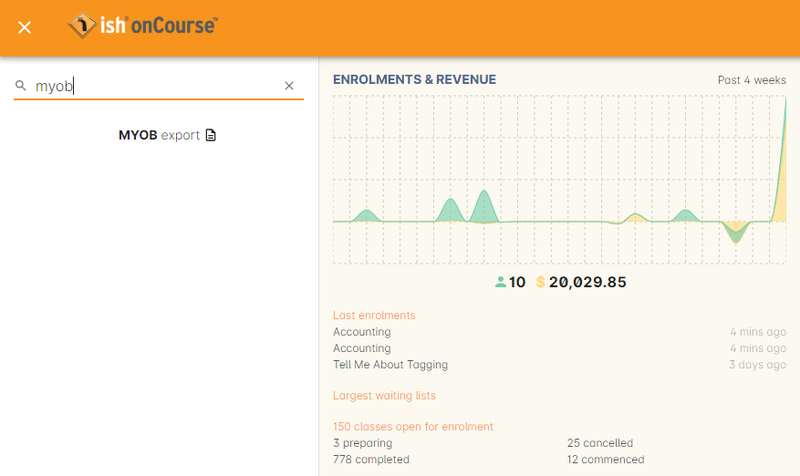 onCourse AVETMISS outcome update import - Using data from an import set of NAT00120, NAT00060, NAT00080 and NAT00085 files, update existing students in onCourse with prior learning data. This process does not create new contact records, only adds prior learning data to existing contacts. onCourse AVETMISS student import - Using a data from an import set of NAT00080 & NAT000085 files, create new student contact records in onCourse. Running this import on the same data set twice will create duplicate records for each student. onCourse AVETMISS student update import - Using a data from an import set of NAT00080 & NAT000085 files, update existing student contact records in onCourse. This process does not create new contact records, only adds prior learning data to existing contacts. onCourse contact CSV import - Import contact data from CSV file to create new contacts, students, tutors and/or companies in the database. Running this import on the same data set twice will create duplicate records for each student. onCourse paymentIn CSV import - Using CSV data, import paymentIn information in order to automatically match paymentIn records with invoices. onCourse Contact Update Subscriptions CSV import- Search for contacts based on the provided email address and update their marketing permissions in bulk. If you receive bulk payment data from an outside source, you can use the Payment In import process to automatically create payment ins against the appropriate invoices. You will just need to ensure the import file is correctly formatted and onCourse will do the rest for you. The import process relies on the onCourse invoice number being associated with the payments, and if your onCourse invoice number is not included in the information then the payment in import will not work. If the invoice number is included in the data, then your next step is to determine how you will create the import file. If your data is being sent from a supplier, internal department other businesses you are working with, you may be able to get them to format the data when they export from their system. If you are not able to get the export form changed, such as with internet banking, you many need download the data, edit it in a spreadsheet program, and save it as a CSV format. 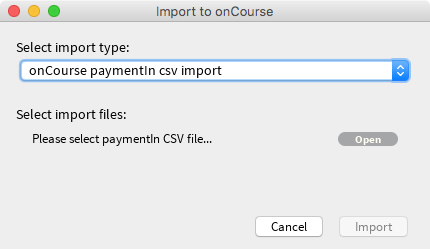 To import the CSV, go to File, Import/Export, Import... and select 'onCourse payment in csv import' as the import type. Please see below for the import file specification. You will need to ensure that each line in the CSV relates to an invoice, or the import will fail. To make sure this is the case, please deleted any lines in the spreadsheet that appear after the last invoice record. This import will allow you to update, in bulk, the email, post and sms subscription preferences of a contact record, as identified by its email address. 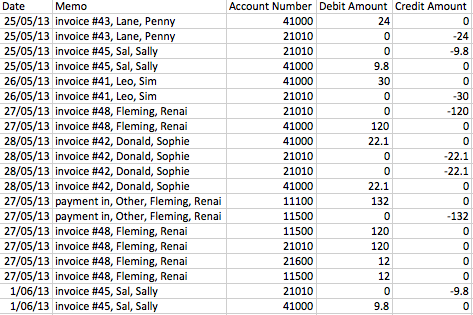 Below is an example of how your CSV file should be laid out. When you format your CSV, be sure to allow the table headers otherwise the import will fail.